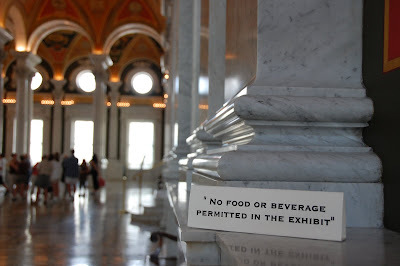 Beth took this picture in the Library of Congress. I must say, of all the possible slogans for the library, they could have chosen better. there's something about "beverage" that bothers me. i'm not sure it's actually wrong, and it's further confused by "food" which is the same singularly as well as plural, but it's like saying "no candybar permitted in the library." it should be beverages, right? Which of course means please eat cheetos and drink grape juice before touching the exhibits.